It’s been such a busy week I’m just now sitting down to tell you about my wonderful Monday night. My dear sister-in-law M and I drove two hours to see Casting Crowns and Nicole Nordeman in concert. Yes, it was M, me, and five thousand screaming teenagers. But it was an amazing evening. But what if you’re wrong? What if there’s more? What if You jump? Just close your eyes. What if the arms that catch you, catch you by suprise? And here is something fun–remember in the olden days how people used to flick their Bics at concerts and wave them in the air? Well, these days they open up their cell phones and wave the glowing screen in the air. (Seeing as how I haven’t been to a concert since cell phones were INVENTED, I had no way of knowing this. My much cooler sister-in-law tells me this is common knowledge, but I thought I’d tell you in case you’re as endlessly uncool as I am). Best of all was the time spent with M. Lots of laughing, crying and girl-talking! Sometimes I forget she’s not my biological sister. Wish you all could meet her–she has quite a story to tell of God’s faithfulness. In my favorite Nicole Nordeman song, Nicole celebrates God’s faithfulness through all the stages of our lives. She beautifully refers to Him as her "Pasture Maker". I needed that image as I wrap up a busy week in which I spent all too little time resting in Him. Here’s hoping for some good "pasture time" for you and for me this weekend. Happy Friday, friends! How fun for you! I am also uncool and ignorant of the cell phone thing. Seems much safer, though! Have a good week end! Sounds like a fun night. I love Nordeman’s lyrics, too. I absolutely love Casting Crowns. I saw them in concert a couple of years ago, and WOW!I know you had an awesome time. Love, love, love Casting Crowns. My kids and I dance all over the place to their songs. Yet, my favorite is not much of a dance song. I will always find a special place for “Voice of Truth”. It is kind of our theme song at our house. BTW, had NO idea about the cell phone thing either. Guess that just reveals my “uncoolness” too!! You look great — not uncool at all! Ahhhh…My husband and I just went to the SAME tour last Saturday night in St. Paul! I posted a photo of the “Crowns-up-close” on my blog. 🙂 I was equally taken by the cell-phone thing! Wasn’t that cool? Hi Shannon! My wife and I also saw Casting Crowns and Nichole Satuday night. Fantastic concert!! Sadly, Nichole did not do the song “Seasons” for us. We had alot of fun though, on our little “date night”. 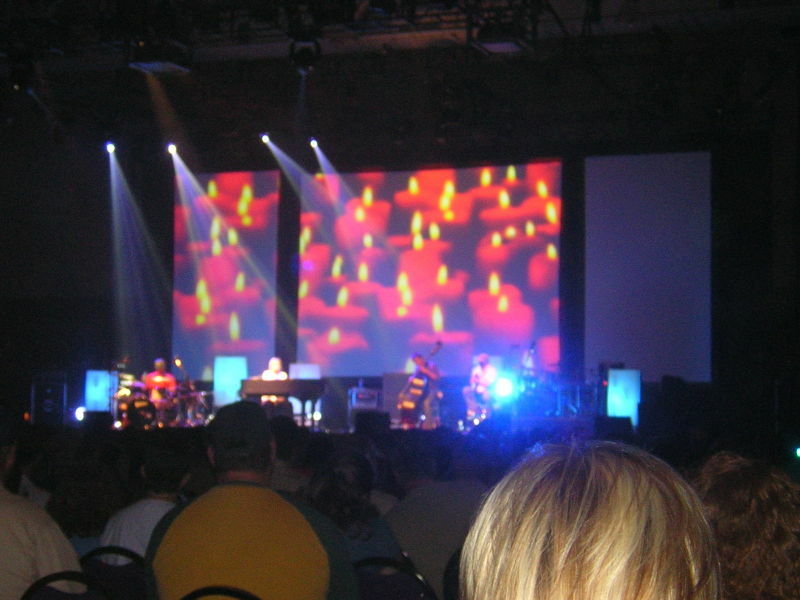 We try to see as many Christian concerts as time and finances will allow. It’s the whole worship atmosphere that’s so cool. God bless you! I’m glad you had such a good time. 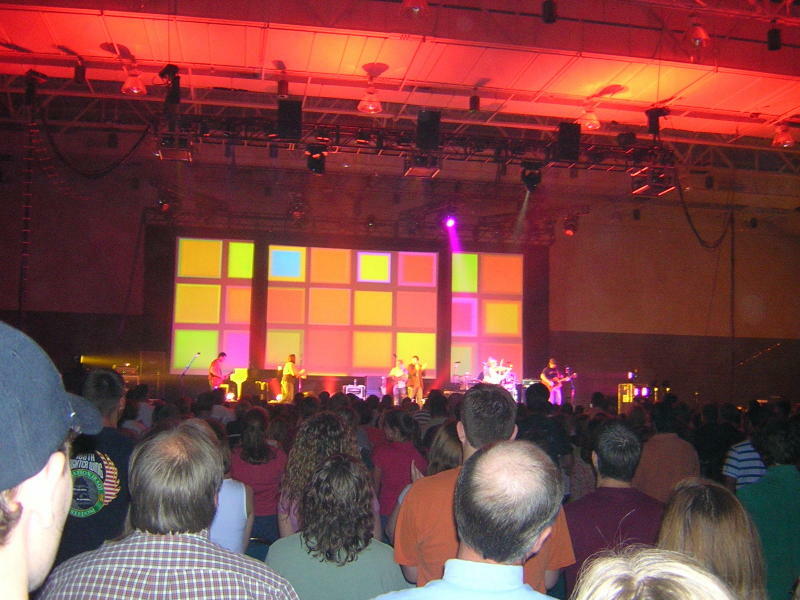 I attended a Christian concert last year where people did the cell phone tribute. It was so funny to me that I giggled throughout the inspiring ballad. That guy in the second picture in the plaid shirt looks like my dad from the back. Man! I hope they come back around soon. I LOVE BOTH OF THEM!!! Sounds like you had a wonderful time! I think it is GREAT how well you and your S.I.L. get along! I wish my S.I.L. and I got along better. I try really hard but I am more of the “family” girl and well she likes to be out on the town. We haven’t found our common ground yet. I pray one day we will! Oh I had no idea about the cell phone thing either! How FUN! I love Nichole Nordemann. I saw her when she was in Denver for the Women of Faith conference last August. So talented, wise, intelligent. I found out about the cell phone thing when my SIL and I saw U2 last year. Wow, Wow, Wow… that must have ben some concert! I enjoy both of those groups!! I had heard that about the cell phones… but I haven’t been to a concert to actually see it. Guess what I heard must really be true! We went to a Casting Crowns/Steven Curtis Chapman/Chris Tomlin concert while Reagan was in utero (bad mom, I know! ;). Casting Crowns was amazing; and I think that night we decided we could call them a “favorite”, and title we haven’t given too many new artists. They have an awesome heart for God! Glad you had a good time. I had no idea about the cell phones. I guess I am a nerd. Thanks for posting those lyrics. I love those songs, and hadn’t thought of them in a little while. Now I’ll be humming them all day as I clean. That’ll be nice! Cell phones? Amazing. I’m such an uncool mom. But you won’t tell people will you? I can still sit at the cool table? Shut UP you got to see Nicole. She is one of my favorites (although no one beats my girl Sara). Lucky lady! Sounds like you had a great time! I will have to check out Nicole. The lyrics you wrote down sound familiar, but I have never conciously heard her. Casting Crowns is really good. Glad you had a great time! I saw their concert in Tulsa with my husband on Valentine’s Day. I had seen both “groups” in concert before, but this was the first time I got to hear “Brave” live. I talk about that song all the time – it seems to describe my life well or at least the way I want to live my life. I’m so glad you were able to go and had some incredible girl time, too. I can always count on one of my best girlfriends to join me at a good concert and we always have a blast! So long status quo, I think I just let go. You make me want to be Brave. The way it always was is no longer good enough. You make me want to be Brave. I’d have to say that the guy sitting a couple rows ahead of you doesn’t appear to be a teenager either. 🙂 The teenagers may be a little more vocal, but we adults love Casting Crowns too, don’t we? I love how God uses people to touch the lives of other people. I so love both of them!!! Two of my faves!! Glad you had fun. I saw Casting Crowns last year at a local college. It was an outdoors FREE concert and I felt like an old, old, old woman — who was loving every minute of it. Glad you had such a great time! Okay I probably shouldn’t admit this but at the Motley Crue concert hubs and I went to last year for my birthday, it was still BICS, not cell phones, but then it was a bit different atmosphere than Casting Crowns live! 😀 SO glad you and M have a close bond and had a good night out! Hey! I just ready your blog, while sitting in a hotel lobby at Doug’s Grad Weekend….you sparked my memory, and made me smile. I THANK GOD for you every day! Thank you for being such an amazing part of my life, and sharing one of the COOLEST memories with me. so glad I stopped by. I love casting crowns and I’m 46 and uncool. But they are great. The lyrics just cut to the chase and the music is fab. jealous of you. ashamed to admit it but I am. laughing. What’s it like to get to go out? It’s been so long I’ve forgotten what it feels like. Seriously though, gosh it sounds like you had fun! What a memory. Nichole Nordeman is the only Christian artist (well, since Bach) that my husband will listen to. She’s great. The important question is: Did you crowd surf? Nichole’s lyrics are amazing. I love her. Okay, I am just going to hand that little container of green envy back to satan! I am so glad that you had such a blessed time with M and with the groups. See, now you are so hot and happening and with it. i’ve gotta get to OK and meet you sometime! did they sing “And Now My Lifesong Sings”?